The new ChillFactor Drinks bottle is ideal for hopefully those warm summer days that we should be experiencing in the near future. The bottle has a magical core which you place in the freezer, rather like a cool pack which can keep your drink cool for up to 2 hours. The bottle is really easy to assemble, Grotbags managed it quite easily as you can see from the video below. You place the core back inside the bottle and fill it with a drink of your choice (not fizzy drinks) to the holes at the top of the inner core. 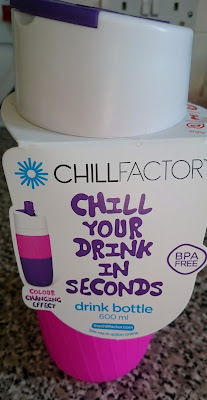 Once the bottle is back together, gently squeeze it to activate the chilling process, at this point the bottle will start to change colour, our bottle is pink and turned purple when chilled, but it is also available in blue. There are two ways to drink from the bottle, either through the straw or sippy cup, Grotbags uses the straw as finds it rather fiddly to fit the stopper back in to the sippy cup hole. The upper parts of the bottle are safe to be washed in the dish washer (top rack only) but the bottle and ice pack are hand wash only. The bottle is priced at £12.99 which I think is reasonable and as you can see Grotbags is impressed and ready to take it on a picnic. Sounds like a great idea - perfect for really hot days and holidays!